You may also have this trouble. You are not alone. The lock screen iPhone is easy to turn off even when you forget the password. Method 3: My iPhone is Frozen on Lock Screen? The Fixes! 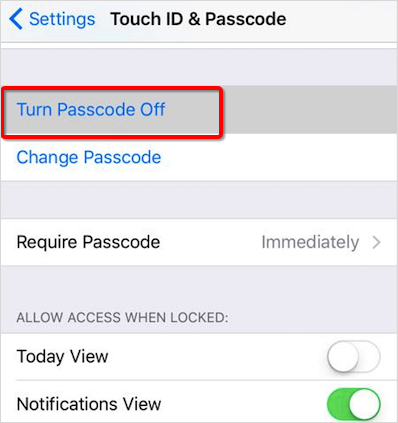 If you want to turn off lock screen on iPhone, this simply implies turning off the passcode with the aim of getting the lock screen to disappear whenever your password is disabled. Step 1: Go to Settings on iPhone and select Touch ID & Passcode. Step 2: Type your screen lock password. Scroll down to locate the "Turn Passcode Off" option. Select it. Step 3: A pop-up box will appear, asking you to confirm the process of turning off your password. Simply click on "Turn Off" to turn off the iPhone screen. Step 4: For you to be able to disable the password, your initial password is required. Simply input the original password. Immediately the password has been disabled, you will not be required to enter it. There is time that you forgot the password for the screen lock and you can’t get into your iPhone. You are not alone. When you type the wrong password for several times, iPhone will show you that “iPhone is disabled”. If it’s you situation, here are 3 ways to fix it. iMyFone LockWiper (Win & Mac) is specifically developed to handles all situations with iPhone lock screen. Compare other ways to unlock iPhone, LockWiper promises easy-to-use feature, high success rate and faster speed. In just a few minutes, you can turn off the lock screen from iPhone without entering passwords. Step 1: After you install LockWiper on your PC or Mac, launch it and connect your iPhone. Choose "Unlock Screen Passcode" from the interface. Step 2: Click "Start". Then click "Download" to get a firmware package for your iPhone. Step 3: When it's done, click Start to Extract and it will unzip the downloaded firmware for your iPhone. Step 4: Then click Start Unlock. Type 000000 into the box and click Unlock to confirm. LockWiper starts to apply the firmware to turn off lock screen on your iPhone. iMyFone LockWiper is not free, but it deserves the money, which is according to its users' feedback. You can get its license here: for Win or for Mac. 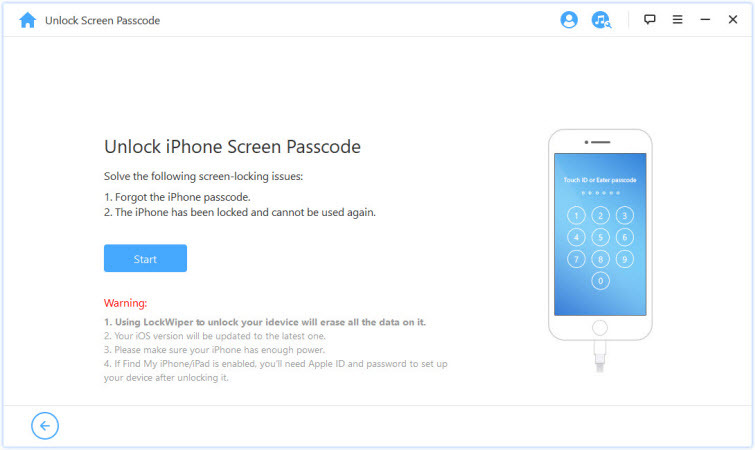 iMyFone LockWiper not only turns off lock screen on iPhone, but also removes iCloud account and Apple ID. Its feature "Unlock Apple ID" is developed to unlock iCloud without password. After unlocking, you can activate your iPhone with a new Apple ID and enjoy everything. No worries, your iPhone won't be linked to or tracked by the previous iCloud account. Click on the device tab on iTunes when detected. Click “Restore iPhone” to let it reset your iPhone. When it finishes, the screen lock is removed from your iPhone. Note: This way doesn't work if the "Find My iPhone" is enabled on your iPhone. This method is available for any situations. Step 1: Connect your iPhone to computer and launch iTunes. For iPhone X/8/8 Plus: Press and quickly release the Volume Up botton > press and quickly release the Volume Down button > press the Wake/Sleep button until you see the “connect to iTunes” screen. For iPhone 7/7 Plus: Hold the Wake/Sleep and Volume Down buttons at the same time until you see the “connect to iTunes” screen. For iPhone 6s and earlier: Hold the Home and Wake/Sleep buttons at the same time until you see the “connect to iTunes” screen. Step 3: When you see the pop-up on iTunes, click on “Restore”. It will download the software to your iPhone. If it takes more than 15 minutes, your device will exit recovery mode. You need to repeat Step 2 and Step 3. After removing the screen lock from iPhone, set up your iPhone by restoring the backup from iTunes. My iPhone is Frozen on Lock Screen? The Fixes! Try to turn off the iPhone and turn the iPhone on again within few minutes. You need to hold the Sleep/Wake button for few seconds until you notice the appearance of a red slider. Slide the slider to power off the device. You can force a reset if all the available options refuse to work. Forcing a reset will not delete any data from the device, but may fix your issues. On iPhone X/8/8 Plus: Press and quickly release the Volume Up botton > press and quickly release the Volume Down button > press the Wake/Sleep button until you see the Apple icon. On iPhone 7/7 Plus: Hold the Wake/Sleep and Volume Down buttons at the same time until you see the Apple icon. On iPhone 6s and Earlier: Hold the Home and Wake/Sleep buttons at the same time until you see the Apple icon. You would be existed to know that LockWiper not only turns off lock screen without password, but it also fixes iPhone failures, especially issues related to iPhone lock.